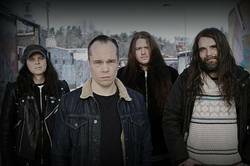 Sweden's Martyrdöd are back with Hexhammaren, their seventh album, on May 10. In preview, the band just unleashed a new vide for "Helveteslarm," below. The band will tour North American in May, playing dates with Skeletonwitch, Soft Kill, Wiededood, and more. Southern Lord is handling the North American release while Century Media will released Hexhammaren elsewhere.